Compression Molding Rubber - Coi Rubber Products - CALL NOW! Coi Rubber utilizes the rubber compression molding process to produce a range of precision rubber molded components. The benefits of rubber compression molding are realized in a number of areas from low to medium volume applications and for some specialty high volume components. Products produced from Coi’s proprietary compression molding rubber process can be designed to be high precision, low waste, and near flash-less out of the mold. The rubber compression molding process begins with a piece of uncured rubber which has been performed to a controlled weight and shape. This preform is placed directly into the rubber mold cavity prior to mold closure. As the mold is closed, the material is compressed between the plates causing the compound to flow to fills the cavity. The material is held in the mold under high pressure and elevated temperature to activate the cure system in the rubber compound (rubber is vulcanized). The cycle time is established to reach an optimal level of cure. At the end of the cycle, the parts are removed or ejected from the cavities and the next cycle begins. Compression molding rubber is a manufacturing process that involves rubber being inserted directly into the cavity of a heated mold. The rubber is forced to conform to the shape of the mold through the application of heat and pressure which are maintained until the rubber has cured or vulcanized. Compression molding rubber is often used to form large or intricate parts and produces very little wasted material. It is one of the lowest-cost molding methods especially when you work with Coi Rubber because we produce your parts in-house from start to finish. If you need large or intricate rubber parts, we often recommend a compression molding solution. This is a highly efficient option, and we can handle every step of the manufacturing process, from start to finish. You send us the print, and we’ll take care of the rest. 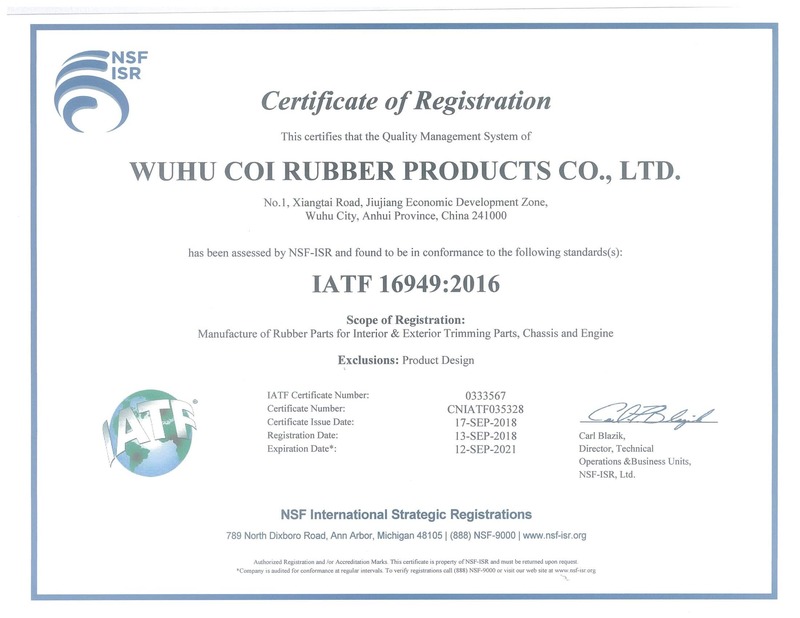 We will create your mold (or use your supplied mold), determine the proper rubber formulation to meet your specifications, mix the rubber, preform it and manufacture your parts. High performance plastics such as PEEK, Torlon®, Aurum® PI and more. Transfer molding begins with pre-formed uncured rubber that is placed into the transfer pot of a closed molding system. The ram/plunger then distributes the rubber into the cavities to be shaped into the part, which is then cured by the application of pressure and heat for a specified time period. Transfer molding can be used for highly complex part geometries and precision applications, as well as over-molding. The process is suitable for molding parts with traditional organic black rubber as well as pigmented materials. Injection molding of liquid silicone rubber (LSR) is a process to produce pliable, durable parts in high volume. Liquid silicone rubber is a high purity platinum cured silicone with low compression set, great stability and ability to resist extreme temperatures of heat and cold ideally suitable for production of parts, where high quality is a must. Our in-house rubber formulation and molding facilities can meet our customers’ most precise requirements for customized precision rubber components used in the Automotive, Consumer Electronics and Mobile industries. We have a completely automated mixing facility from the third floor down with full automation and quality control. We also have the expertise required to produce rubber to metal bonded bushing and very high demanding applications. Coi Rubber offers Rubber Compression and Injection Molding services and is equipped with a wide range of molding machines with clamping forces ranging from 30 to <650 tons. Our highly skilled engineers and technicians work on our computerized injection molding machines to ensure that each molded part meets the product specifications of our customers. These are complemented with various secondary processes including ultrasonic welding, laser marking and robotic spray painting. This integrated solution reduces total manufacturing time and manages overall cost effectively. To gain a better understanding of the compression molding processes, materials and technical considerations involved in the design and manufacture of custom-molded rubber and plastic parts contact us today!